Recently I aquired a collection of vintage, identical model racing cars, in five different color combinations. The models were retrieved by a friend over twenty years ago from a house in Frankfurt in Germany. The cars are all unused, packed together in numbers of some twenty to thirty cars, still sitting in over sixty-year-old cardboard boxes. Inside the boxes we found some pages from the 1948 Berlin newspaper Der Kurier, as well as some technical German norm sheets from 1944, used as packaging material. The boxes were sent from one Friedrich Wilhelm Krebs in Berlin to ‘Fraulein’ Tilly Krebs in the ‘American Zone’ of Frankfurt, presumably in 1948. And that is where they stayed; the models were never unwrapped, sold, or used. The models are of the famous Auto-Union racing car, designed by Ferdinand Porsche’s design bureau, which made its debut in 1934 – most notably of the 1934 Auto-Union Type A ‘long-tail’ model. The racing cars by Auto-Union as well as their competitors by Mercedes-Benz – known as the ‘silver arrows’ – were the flagships of Nazi-Germany and delivered fierce combat with Bugatti, Alfa Romeo and Maserati racing cars on the European racing circuits up until the outbreak of World War Two. The Auto-Union racing cars clearly had their heyday in pre-war Nazi-Germany – but when where these models made? They must be either from pre-war old stock, or of early post-war production, presumably using pre-war casting molds. driver’s seat only contains the number ‘B 1300’ and a tiny logo with a letter ‘B’ in the centre, presumably reading ‘K B G’ (this could stand for a KG ‘Kommanditgesellschaft’, a kind of Limited Partnership, from Berlin) or or ‘K B K’ (one source mentions Kurt Becker KG as the possible manufacturer). Could Friedrich Wilhelm Krebs from Berlin, who sent the boxes in 1948, have been the manufacturer? Not many period models are known of the Auto-Union racing cars. 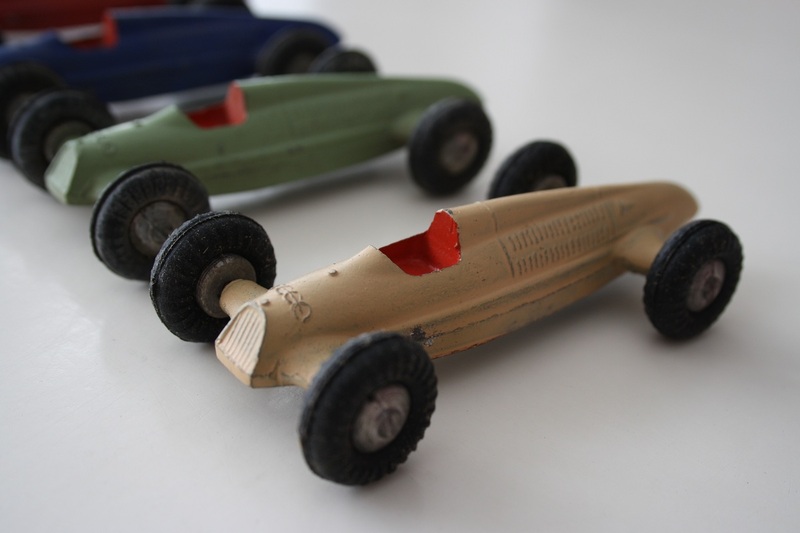 From 1936 to 1952, Dinky Toys produced a 1:43 model of the Auto-Union Type B with a special, closed aerodynamic body – famously raced by driver Hans Stuck for a speed record attempt in Italy in 1935. Any information about the newly discovered unknown models is greatly appreciated! As soon as more information has been gathered about the historical background and signifigance of these models they will be offered for sale, either individually or in sets of 5 cars – one of each color. This entry was posted in Vintage toys. Bookmark the permalink. Found out about your collection from Paul Chenard. GREAT story and fabulous collection! I posted this on my Facebook page to help your quest for more information. I want to know more, too. it seems that mine – found on the attic of my grandfather´s house some years ago – is from a different manufacturer, but made in the same style and period. zink casting, rubber tires on lathed wheels, silver arrow era etc… a label in the casting on the right side claims “GMC” or “GC”. unfortunately, i cannot contribute more to this topic but totally understand your passion for the toy´s esthetics. Thanks for your message! Your MB W25 model racing car looks fantastic! And looks a bit similar to my Auto Union models, but probably a different manufacturer. I will send your photos to a friend who collects vintage racing car models and see what he says. Sorry, my mistake. This Märklin logo is called “Fahrrad” (bicycle) not “Lokomotive”. Hello! Did the cardbord box in which the racers came carry any marking, price information or else? If so, could you mail a picture? There is one more KBK product known, a 1946-48 Buick Special Sedan. It is 8.5cm long, approx. the scale of “S” gauge, and marked KBK B1310. We showed two of these in the Epoche Modellautoheft 3 which is still available. One is RAL resedagrün and one rather sea green for US customers. A Berlin vendor at the Walldorf swapmeet showed a red one. This model is up to any standard of its day, if not ahead. But metal fateague is heavy on all three I saw. Thanks for your comment! You can reach me through the comments section, or I can e-mail you directly if you wish? Finally we know more about these cars. Kurt Becker had a daughter and two sons. They told me a lot about the company of KBK. And there where some more models. More about KBK in my new blog.